Life Lesson 7,250: Do not, under any circumstances, leave technology unattended in the presence of pets. Look, guys. I know about half the Internet twitches with outrage at the title of this blog post. I questioned it myself*. But then I learned this lesson for real. *No I didn’t. All my best pictures are selfies because I would never, ever let anyone else take eighteen pictures of me in a dinosaur costume. I do have SOME pride, people. I want to show you something. And it may shock you. 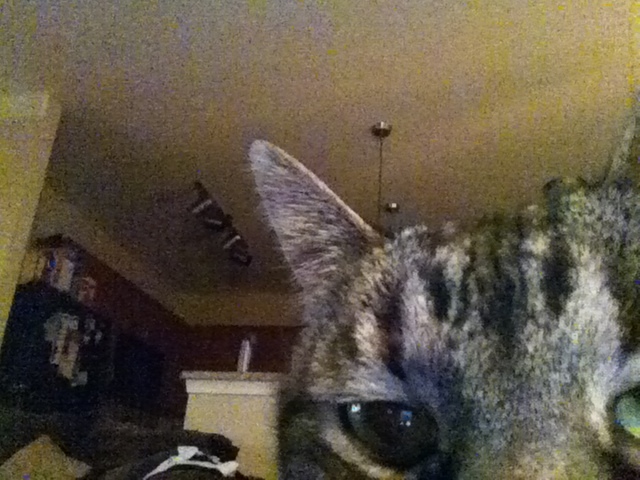 This is the selfie my cat managed to take of herself. Because, you know, clearly I wasn’t taking enough pictures of her. Animals don’t even need us anymore. It’s like Animal Farm, but with more technology, and probably called Animal Myspace. We can’t let that happen. It’s just awkward for everyone. So it’s really important to know one thing: if you leave your phone on the couch, your cat will learn to take pictures of herself using her face. I can’t even add a completely different thought at the end of this blog post. I’m too shocked, horrified, and concerned for the future of us all. I did it just for you. And you and you and you.